God makes many promises and He keeps them all. We can have great hope and joy in knowing that God never breaks a promise to us. 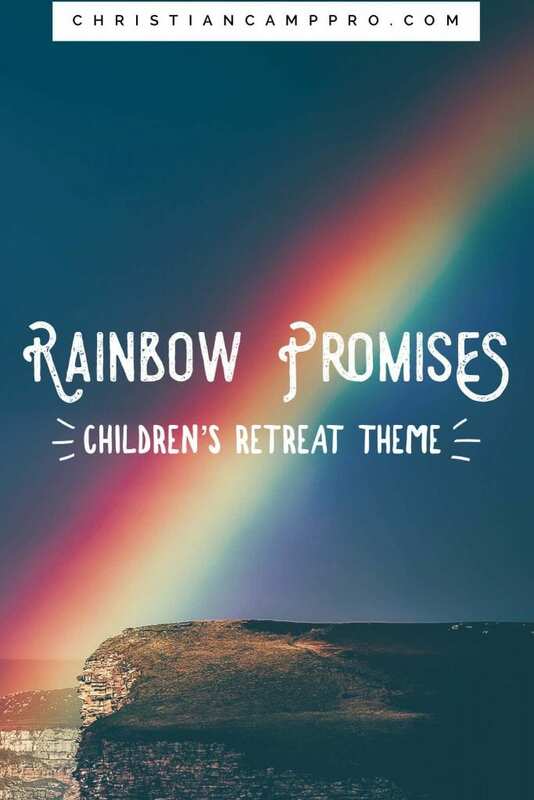 This Rainbow Promises retreat theme will explore some of God’s promises to His children and the way He has kept them through the centuries. After the flood, God made a promise to Noah and to every living thing on Earth. He promised He would never destroy the earth again with water. As a reminder to us of this promise, He made a rainbow. Use the scripture passage to remind young people that every time they see a rainbow they can be assured of God’s special promise. It can be hard for us to keep promises. We make and break promises on a regular basis, but God is always faithful and true to His word. Use the scripture passage to show young people that God will honor His promises even if we don’t. He is always faithful! Sometimes even the bravest people feel afraid. But God has promised to always be with us. We can have the courage and strength knowing that we never go alone. Share this scripture passage and remind young people that even when they feel alone and afraid, God has promised to stay with them. He never breaks His word! This craft is simple but beautiful. Supply each guest with an assortment of colorful pony beads, prisms and fishing line. Help guests follow the instructions for threading the beads onto the fishing line and attaching the prism. Not only does this produce a lovely hanging piece, but when it the prism catches the light it will project rainbows onto the walls! Mix up a batch of this super cool slime that is both vibrant and non-toxic. The recipe is simple and contains readily available materials like Kool-Aid and Psyllium husk powder (found in some varieties of Metamucil.) Make batches of several different colors and mix them together for a rainbow slime effect. This lovely craft gives empty windows a beautiful stained-glass look! Supply each guest with an array of colorful tissue paper (cut into squares), Mod-Podge, heart template and sheet protectors. Instruct guests to glue the tissue squares onto the sheet protector using the Mod-Podge. Once dry, cut out a heart shape using the template. Attach to the window with double-sided tape. Expend some energy with this fun relay race. Each guest is assigned a color. Rainbow ribbons or streamers are spread out on the other side of the room. Guest must quickly gather their ribbons while performing fun actions like twirling, jumping or dancing with the ribbons. It’s a race, so the first one finished wins. This game is a great way to exchange gifts or hand out door prizes. Each guest is given a gift wrapped in several layers of colorful paper. When music is played the gifts are passed around the circle. When the music stops, guests unwrap one layer of the gift they are holding. The music starts again and the gifts are passed and unwrapped until each guest has a fully unwrapped prize. Give each guest one of the printable bingo cards and colorful candies or cereal to use as markers. Guest can fill in the lines vertically, horizontally or for an extra challenge try to fill in the whole board. The first one to fill a line or board wins. Try out a colorful and fun experiment with guest using Skittles candies. Sort the colors ahead of time. Give each guest a white paper plate and allow them to arrange their Skittles in a pattern around the edge of the plate. Pour enough warm water onto the plate to cover the Skittles and watch as the colors begin to run and swirl. Guests will want to do this over and over, so make sure you have plenty of plates and Skittles! Give your guests a tasty take-home with these cute printable treat bag labels. Simply fill snack bags with Skittles and attach the tags to the treat bags. Guests can take home their rainbow seeds to do more rainbow experiments or just to munch on until their tongues turn rainbow colors! Rainbows are more than just beautiful colors in the sky. They serve as a reminder of God’s promises to us. A Rainbow Promises retreat can help young people understand that God is faithful to His promises and that He will always be with them.